Next Wednesday sees the 30th anniversary of the death of the prelate who, quite possibly, became American Catholicism's most consequential product of all: Fulton Sheen, the Illinois farmboy who famously trumped "Mr Television" in the ratings and, in the process, delivered the death blow to the long history of societal suspicion directed at the church's own on these shores. With the evidence of his heroic virtue -- the first step toward a possible beatification -- soon to face investigation in Rome, the archbishop's New York-based cause has sparked a worldwide roster of Masses to crop up to commemorate the anniversary, the largest of which will be held in St Patrick's Cathedral at 5.30 Wednesday night, to be celebrated and preached by a well-known devotee of Sheen's ministry in media: the Big Apple's Archbishop Tim Dolan. In the history of the Stateside church, Dolan recently mused in an EWTN interview that "there’s never been anybody who’s been able to communicate the timeless truths of the Catholic religion to a very timely culture" as Sheen did, "without diluting any of the essentials." The Elegant One "was able to present [the faith] in an eminently attractive way," Dolan said, "and that has always inspired me." For those unable to make it, the evening liturgy will be streamed live by both EWTN and CatholicTV. Prior to it, though, a rare opportunity will present itself as the St Pat's Crypt -- where Sheen's buried alongside Gotham's archbishops -- will be opened to the public for prayer from 3 to 5pm. 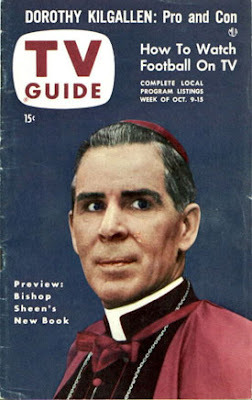 An auxiliary of New York from 1951 until his appointment as bishop of Rochester in 1966, Sheen rests next to his arch-rival in the hierarchy, Cardinal Francis Spellman. Speaking of New York causes -- no fewer than five of 'em currently afoot -- the Kingdom came early yesterday for the longtime lead champion of another Big Apple saint as Carmelite Sister Aloysius McBride died in the city at 91. Shortly after Cardinal Terence Cooke's passing in 1983, the celebrated, intrepid Irishwoman founded the guild that's prayed and worked ever since for Cookie's elevation to the altars. Even more notably, though, Aloysius' seven decades of religious life were spent in the service of the aged and infirm, most prominently at Mary Manning Walsh Home on the Upper East Side, which she moved to its current location in 1969 and led until her retirement three decades later. McBride's funeral is planned for Thursday at the residence. May she rest in blessed, merited peace.